So, as always, I’ll be plain. I’ve had elbow pain on and off since about January, so when my oncologist’s office called to reschedule my 6 month appointment (which had accidentally scheduled for 5 months), I declined because I wanted to ask her about it. She felt a lump on my cancer side on my rib under my arm. Which could be pinching nerves in my elbow. It could be fatty necrosis from reconstruction and a lymphedema issue in my elbow. Yes, I’m scared. Yes, it’s more likely fatty necrosis than cancer. So I’m trying not to freak too much. But. The thing about cancer is it seems to be unpredictable. So chant with me please. Fatty necrosis. Fatty necrosis. F-A-T-T-Y necrosis. 1. 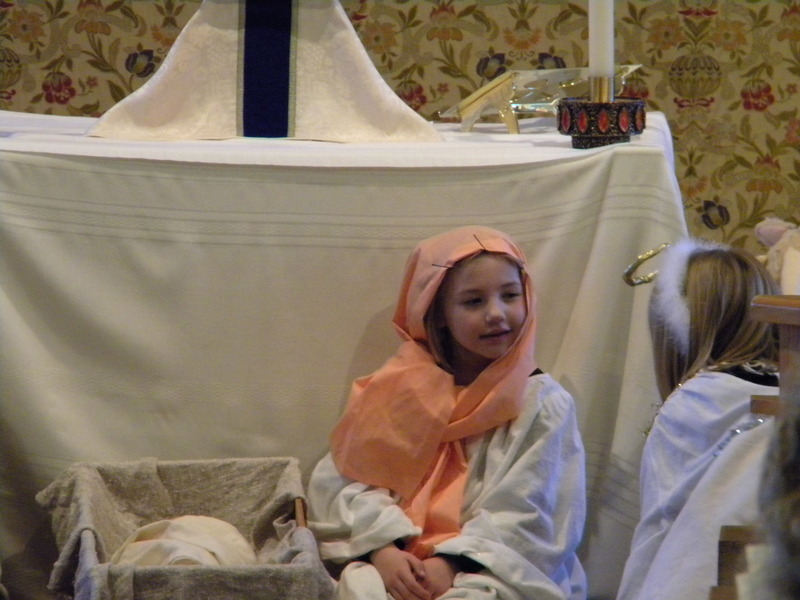 The kids participated in their first Christmas pageant. If I’ve learned anything as a music teacher, programs go however they go. Sometimes they way you planned them. And sometimes not. Either way it usually makes a good story. Our good story is this: after two rather flawless rehearsals where J dutifully pretended to eat hay, he melted during the show. Literally and metaphorically. Heh. In his costume, he looked more like Cousin It, than a donkey. Probably because he wouldn’t wear the ears. So anyway, we were sitting in the back so this is mostly second hand information. 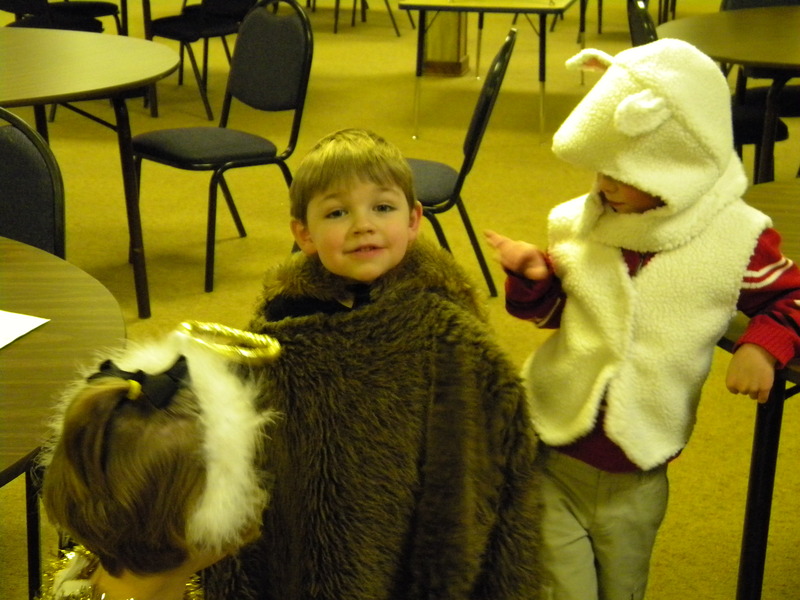 Apparently, he and the sheep were wrestling (behind the altar of course) and he bonked his head on the floor. Well add that to being tired and overheated and he was done. I kind of wish I could have seen the barnyard brawl. An overheated donkey and a sleepy sheep. Having a little chat with an angel. 3. I was noticing the other day that one of the many “gifts” cancer has given me is the ability to swallow a large amount of pills at once. With coffee. 4. Wii Fit Plus is awesome. I especially like being the bird. I like the bicycle riding, but I have a tendency to get lost. So I really get my exercise when I play. I am also appalled at my computational skills. There is a game where you have to bump numbers with your behind to add up to 10. You’d think I’d be able to add to 10. You’d think. Darn negative numbers. 5. I just paid the bill for my lymphedema sleeve. And now it’s time for a new one. Woo. I think I might get a crazy color one this time. Or tie dye my old one. 6. I read my horoscope over at the Yahoo main page today. It says I’m very productive today. Heh. I guess I sort of was. Still have so much to do though. Tomorrow. It also says, “Your new commitment to self has given you a renewed appreciation of the your divine wisdom and accomplishments.” Heh. I especially like the “of the your”. 7. Have a Happy New Year, everybody! Don’t let bad grammar or the inability to add ruin your evening. It’s not ruining mine. Grins. Lymphedema. Bleah. Next to chemo it’s sort of the other great unknown in the cancer world. I know BC (Before Cancer), I had never even heard of it. I take that back. I had heard of it by watching those shows about the really big people on the Learning Channel and it was primarily in their legs. It was definitely not something I associated with cancer. I had my evaluation last Monday, and I was right. My left arm was 2 cm larger than my right, and my left hand is swollen. It hasn’t spread to the fingers yet. I’m currently in a temporary compression sleeve until I can get the permanent one. And the gauntlet. Yep. Gauntlet. Awesome. The lymphedema therapist recommends I wear it 5 out of 7 days. For the long haul. I’m not sure how I feel about that. Annoyed mostly. I also have been doing Lebed exercises to open the lymphatic channels.